This is one of those unique non-commercial titles that makes me feel glad that jmanga.com exists in the current manga market. I decided to take a look at this title solely because of the cover image. I thought the art looked whimsical and quirky, and the inside of the volume matched with my initial impression of the cover. 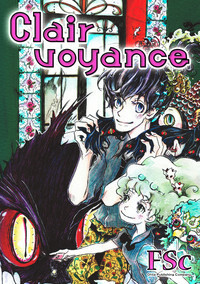 Clair Voyance doesn’t have much of a detailed plot, as it mostly deals with a relentless, classic science fiction novel quoting girl named Pi who fixates on a mysterious classmate named RueRune who goes around wearing a sarong and styles his hair in a bun anchored by random botanical specimens. Pi stalks RueRune, and sees him wander about, talking to the air, buying food, and getting violently ill. Eventually she realizes that his odd behavior is due to the fact that he’s talking to invisible creatures. Where this title stands out from other monster of the week manga is the art and slice of life approach to the material. This title is published by Ohta Publishing Company, which I believe is the publisher of the magazine Manga Erotics F, home of beloved to manga bloggers authors like Natsume Ono, Usamaru Furuya, and Inio Asano. Fsc’s art reminds me a bit of a Natsume Ono, if Natsume Ono was inclined to draw spirits that look like odd hybrids between botanical illustrations and Where the Wild Things Are. Each chapter is basically a short episode where Pi indulges in her curiosity over RueRune by following him around and pestering him, and while RueRune is able to relate much easier to the creatures that surround him, Pi represents the potential for his first true human friend. There were a few typos here and there in the translation for this book. Fans of Natsume Ono would likely appreciate the gentle atmosphere of Clair Voyance, and if you enjoy monster of the week manga but would like to try a title with a laid-back, unconventional sensibility, this is the manga for you.